What is a forecast model and why are they sometimes wrong? Forecast models recreate the earth's atmosphere and then predict what will happen next based on what the atmosphere is doing right now. SEATTLE — You so often hear meteorologists refer to “the models.” If you’ve ever wondered what that means exactly, you’re not alone. Forecast models are recreations of the actual atmosphere to show what it’s doing at this moment across the entire globe. Where is it raining? Where are there clouds? What’s the humidity doing on one part of the globe compared to another? Once we’ve created a model of the atmosphere, we use high-powered computers to work on what will happen next. The laws of physics are excellent at forecasting how the atmosphere will change over time as long as we know exactly what the atmosphere is doing at this moment. That’s where the problem comes in. The atmosphere is so large and so complex, it’s impossible for us to know exactly what’s happening at all points on the globe at any given moment. That is the only limitation of the forecast models we use and because of this limitation, no two models ever agree completely. 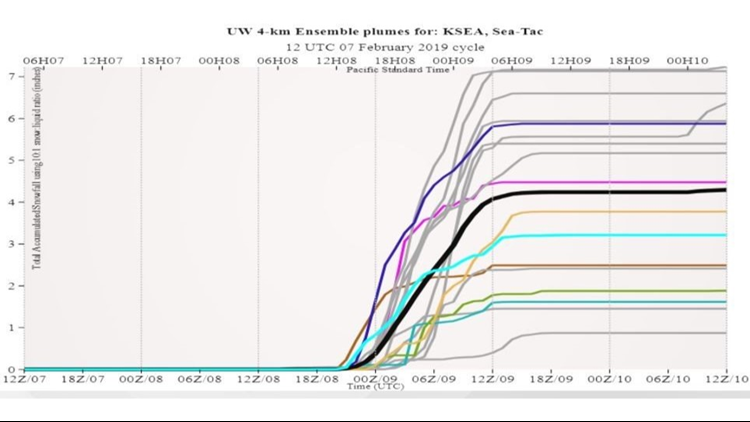 To compensate for the “uncertainty” of missing information at the very beginning of a model run, meteorologists run large numbers of the same model with slightly different assumptions of the current conditions. That gives us an “ensemble” of forecast runs to look at. You can see an example of Friday morning’s ensemble forecast for snow at Sea-Tac. All of the squiggly lines represent each individual member of the ensemble. The important line to look at is the somewhat thicker black line running right through the middle of them all. That is the mean of all the members and the most likely outcome, although by no means a guarantee. Each line represents different outcomes from the same model based on different conditions assumptions. The black line shows the mean and the most likely outcome, although it’s by no means a guarantee. So what about high-resolution forecast models? You’ve undoubtedly heard us reference the UW high-resolution forecast model on KING 5. We are proud to have an exclusive relationship with the University of Washington and the use of their high-resolution model for Western Washington weather. High-resolution in a forecast model means the same thing it does on your television set. If you can increase the computing power and crunch more of the physics equations necessary to define exactly what the atmosphere will be doing, you can get a clearer picture of the details on a smaller scale. That’s how we’re able to call for a certain amount of snow over Tacoma compared to a different number over Everett. It’s important to remember however that even though the computers keep getting better and faster at doing the math, the limiting factor for any forecast model, no matter how detailed, is still our ability to say exactly what the atmosphere is doing across the globe at this moment. Because of that, there will likely always have to be a certain about of “uncertainty” in the models.